Quite a heavy frost this morning accompanied by very low cloud. Do we go or stay? The initial plan was to move forward to the water point and fill the tank. 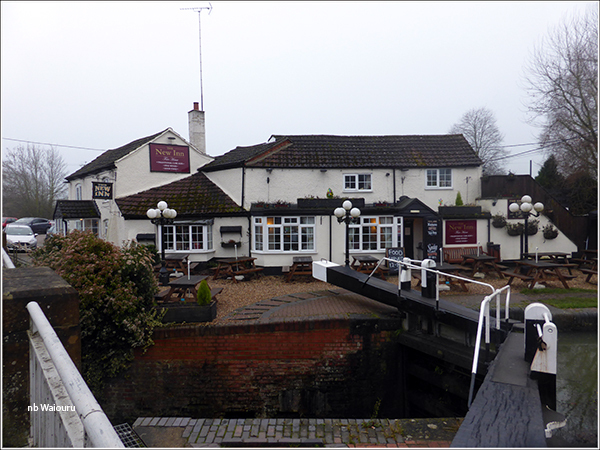 Then go up the first two locks of the Braunston six and moor to have lunch at The Admiral Nelson. The plan almost unravelled before we departed. The mooring ropes were frozen and untying them was like working with steel wire rope. Even when untied they formed a birds nest rather than lying flat. On reaching the water point I was initially unable to open it as the access cover was frozen. Then when I did managed to gain access to the valve it was also frozen. A jug of hot water fixed that, but then the water was frozen in the pipe. I reasoned it was frozen close to the outlet and Jan supplied two further jugs of hot water from Waiouru which resulted in the ice melting. When I ran out the hose from the reel it was obvious we had yet another split in the hose. This “reinforced non kinking” hose has turned out to be a dismal failure. We eventually started to fill the tank after I’d cut the defected end off the hose and refitted the nozzle. A boat appeared from the gloom just as the tank reached full. It was Gary & Della on Muleless. Gary loitered short of the water point whilst I prepared Waiouru to move off. Della informed me they had already passed one water tap which was also frozen. 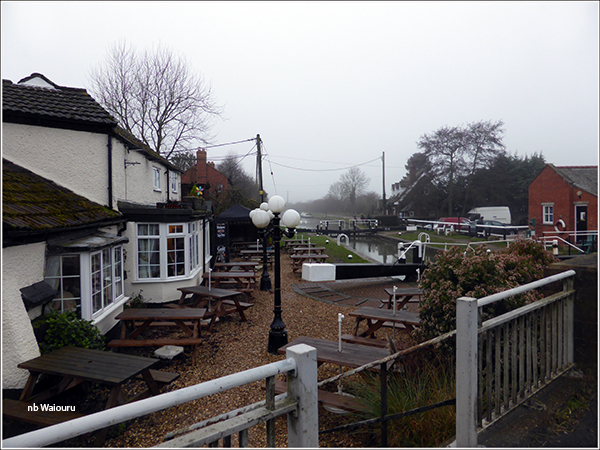 I mentioned we were aiming to have lunch at The Admiral Nelson and she suggested we try The New Inn at Buckby Top Lock just beyond Norton Junction. With a wave to Gary & Della we headed east. They plan to go in the opposite direction. Nick leaves for Hillmorton whilst Waiouru waits to enter the bottom lock. The boat and butty that passed yesterday were moored in the pound above the lock. The photo makes them easier to see whereas the same cannot be said at the time. At the second lock we met a second boat coming down. Good news because it probably meant all the locks would be in our favour. In the end we decided not to break the journey for lunch at The Admiral Nelson and carried on up the flight. Jan was inside the boat when we went through Braunston Tunnel and subsequently told me she could see the bow oscillating. Either it was an optical illusion or the tunnel isn’t straight. I suspect the latter! The far end was just as misty despite the sun unsuccessfully attempting to put in an appearance. There were plenty of towpath walkers but few boats on the move. 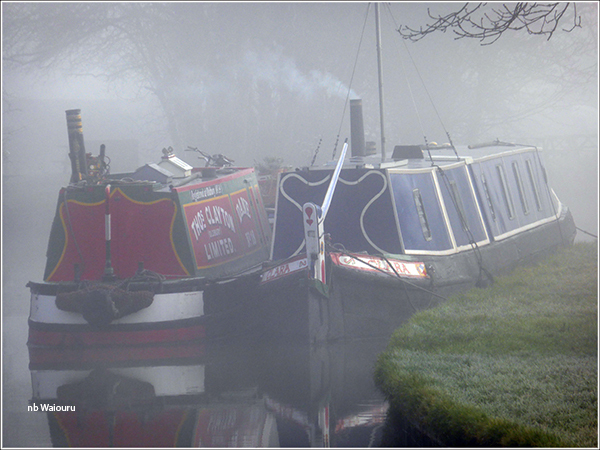 We eventually arrived at Norton Junction and successfully found a space on the 48 hour moorings. It was getting close to 2pm by the time we had walked to The New Inn. Yes, food was still being served. Actually the pub was jam packed. The establishment is obviously very popular. We managed to nab a small table with one chair and I went searching for a second to return with a stool. Both of us opted for the Sunday roast beef. The servings were generous and came piping hot. On the way back we checked the CRT facilities at the lock. Elsan, water, rubbish disposal and toilets. However one of the local boaters informed me the elsan was ‘again’ unserviceable. Not something that affects us. We’re now back inside Waiouru and the mercury has fallen. It might be a frozen canal in the morning! Not that this concerns us. We’re toastie warm inside. 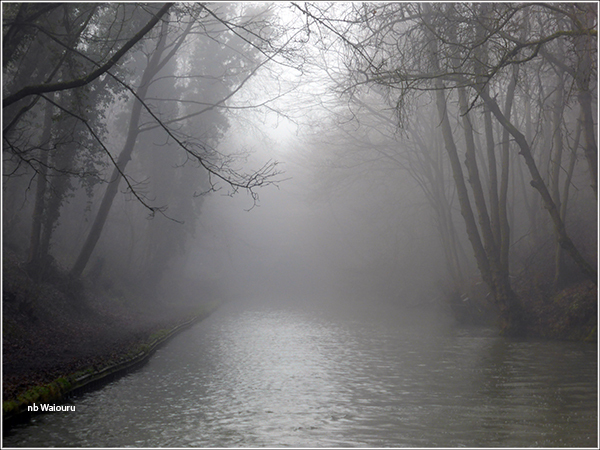 It looks so atmospheric, Tom - just as beautiful as the sunny days, but so very different! No2 son landed in Perth this morning. It's been over 44 degrees and was still 35 at 7pm (local time). They say it's one of the hottest days recorded. Now a beautiful sunny and clear day. Yes, he has arrived to very hot weather. My mother has both evaporative and reverse cycle air conditioning systems working in her house. Provided there is no electrical supply failure, she should survive. Large bush fires in South Australia near our house. We are insured! Good to hear all quarters are covered in Oz. I guess it's a familiar situation to the locals but temperatures of 112 F are difficult to imagine for us Brits. Hope the rest of your family stay safe too. All Jan's family arein Sydney where it's currently quite cold. All my family in Perth (apart from mum) are in Thailand for our nephews wedding. 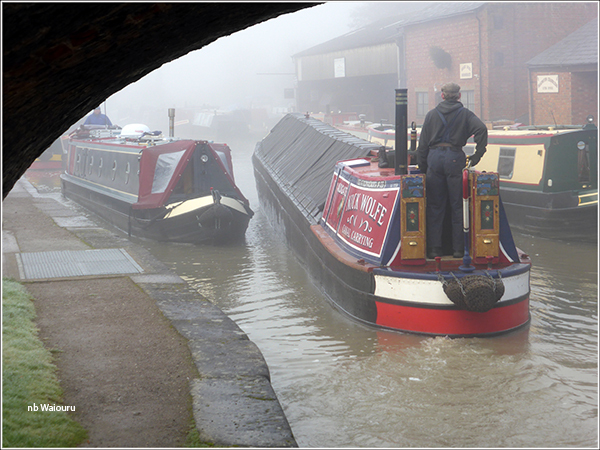 I spotted you a couple of times over the Christmas and New Year period, the last time on 2/1/15 in Braunston. I beeped as I approached but no one appeared so I guessed you were having a jet lag siesta. That was very clever of Nick Wolfe getting in the picture when you were photographing Tranquility. I realised you were in the general area but was so focussed on the lock I didn't notice Tranquility. Either we were away when you tooted or I was having a seniors rest moment!